Many people have microchips implanted in their pets for identification purposes. If your dog does not have a microchip, you might want to consider microchipping your dog. Millions of pets get lost, end up in shelters every year, get separated from their dog collars and tags, and sadly, few of these missing pets are reunited with their owners. Many are adopted out to new homes or even euthanized. Microchip or not, it is important that your dog has identification at all times. A collar with tags is the usual standard, but either can fall off or become damaged. Fortunately, technology has made it possible to equip your pet with a microchip for permanent identification. A pet microchip is about the size of a grain of rice. It consists of a tiny computer chip housed in a special type of glass. The material is compatible with living tissue. The microchip is implanted between the animal's shoulder blades under the skin with a needle and special syringe. The process is similar to getting a shot (except with a larger needle). In most cases, your pet will experience little to no pain from the implantation of the chip; many pets barely notice it. Despite the larger needle, most pets react the same as they would to a ​routine vaccination. If you are concerned your pet might object to the size of the needle, you can have your pet microchipped during anesthesia while being spayed or neutered. If your dog is already fixed, you can have it placed during a professional dental cleaning, a procedure that usually required anesthesia. Once in place, the microchip can be detected immediately with a handheld device that uses radio waves to read the chip. This device scans the microchip and then displays a unique alphanumeric code. After the microchip is placed, the pet must be registered with a microchipping company, often for a one-time fee. This way, the pet can be traced back to the owner if found. Long-lasting: Microchips are designed to last for the life of your pet. They do not need to be charged or replaced. There are no batteries. Update your contact information: Always keep your contact information updated with the microchip registration company. This is so you can be quickly contacted in the event your dog goes missing and the chip is scanned. If you move, get a new phone number, or change your email address, be sure to immediately change your microchip contact information. Free pet registry: Your microchipping company should register the dog, but as an extra step you should enter your dog's unique identifier number in the free pet registry. Some chips migrate: Some microchips have been known to migrate from the area between the shoulder blades. The instructions for scanning emphasize the need to scan the dog’s entire body, including the limbs. 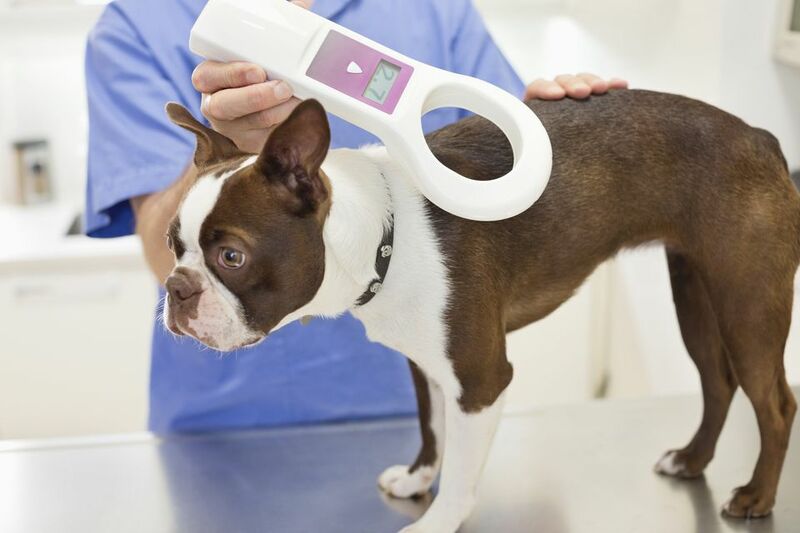 It requires a universal scanner: A microchipped pet can be easily identified if found by a shelter or veterinary office in possession of a universal scanner. However, some shelters and veterinary offices do not have these or any scanners, especially in rural areas. Some chips are old, not detectable: Depending on the brand of microchip and the year it was implanted, even so-called universal scanners may not be able to detect the microchip. This mainly applies to old chips or those implanted in foreign countries. Most new microchips are usually compatible with universal scanners. Improvement process is continual: Microchip manufacturers, veterinarians, and animal shelters have been working on solutions to the imperfections, and technology continues to improve over time. Fortunately, the newest microchips on the market tend to have better readability. Microchips are not GPS: Microchips do not have GPS or other locating capabilities. A lost pet must be scanned by a chip reader in order to begin the process of finding the owner. No method of identification is perfect. Responsible pet ownership includes keeping current on your identification tags (including cats), keep your dog leashed, and refrain from letting your dog or cat free roam. As a backup plan, consider microchipping as reinforcement. If your pet does become lost, more identification can increase the odds of finding your beloved companion. There are many microchip brands and chip registration companies. For your local area, your best bet would be to ask your vet for their recommendation.